Is your network monitoring tool optimized for cloud apps? With most companies moving their applications to the cloud, network performance is more important and IT loses visibility of the apps that are stored in the cloud. The problem is that most network monitoring tools are mostly device-based. AppNeta’s TruPath technology uses a variety of techniques such as packet train technology to build up statistics quickly. 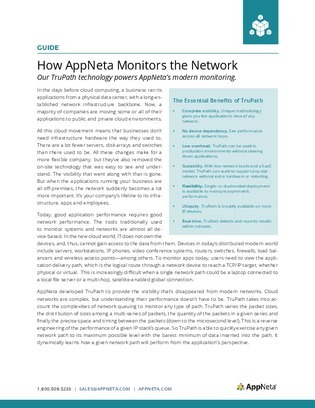 Read this white paper to learn more about AppNeta’s TruPath technology and if it is the right network monitoring tool for your organization.